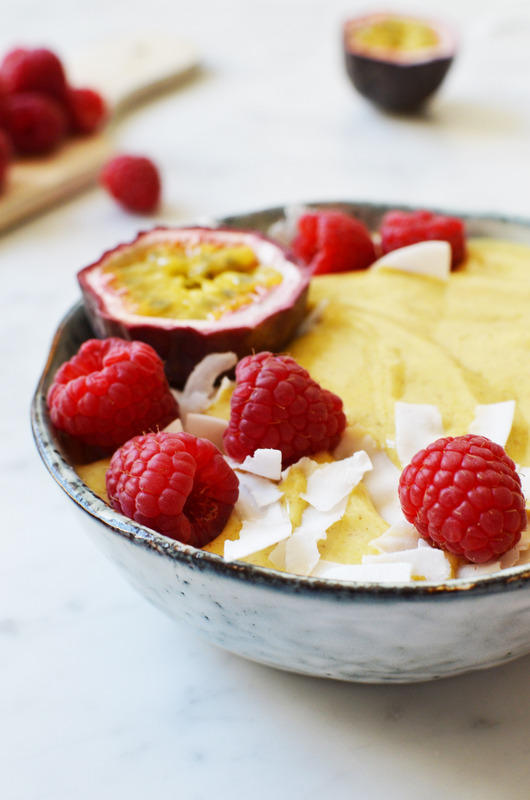 This mango smoothie bowl only has 5 ingredients (okay, 6 if you count water too), and it is super simple to make. You can also replace the mango with any other fruit to make it into e.g. a banana and blueberry smoothie bowl, and I bet one with strawberries and raspberries must be delicious too! The trick to get a good smoothie bowl is to get the right consistency. And to top it with yummy things of course! When I tried to make my first smoothie bowls, they would always fail, because the consistency would be more like a real smoothie, and less like a smoothie bowl, which should be thick enough to support your toppings, especially if you want to use some more dense toppings. 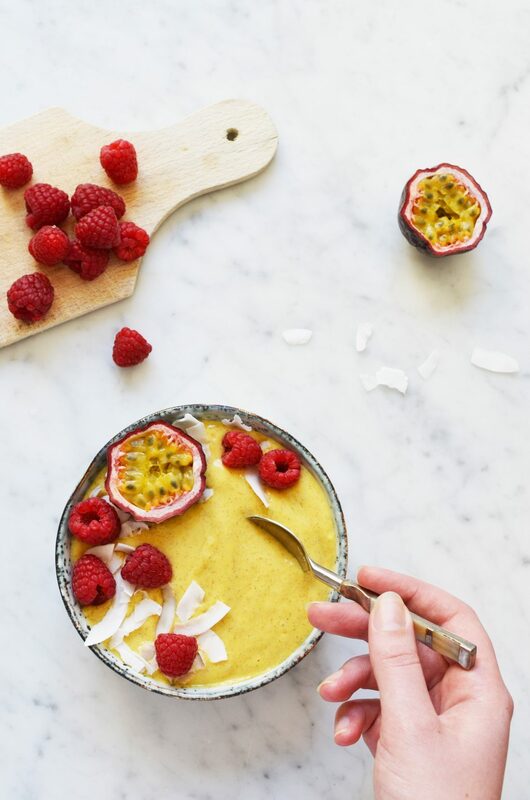 I used fresh passion fruit for example, which would often fall to the bottom with my previous smoothie bowl concoctions. I found that the trick is using something to thicken the smoothie, and use a minimum amount of liquid. My favorite thing to thicken it is chia seeds. I also tried it with oats, but it took way longer to thicken up than with using chia seed, and well, who has got loads of time to wait for breakfast in the morning? Not me!! Combine the chia seeds with approximately 1/2 cup water in a blender (but don’t turn it on just yet!!). Let sit for a few minutes until the mixture turned into a thick gel. It is important to give it these few minutes, otherwise the texture will not be thick enough to support your toppings. It is better to let it rest a little too long than too short, but it shouldn’t take more than 5 minutes to get a gel-like consistency. Add the mango, greek yoghurt, curcuma and ginger to the blender too and blend until the mixture is smooth. Pour into a bowl and top with your desired toppings. Some of my favorites include fresh berries or other fruit, coconut flakes, granola, nuts and seeds and herbs like mint.